I cannot get over how weird this portrait of John Ritchey looks, especially in that face-like area. Really, Jay Leno wants a jawbone like that. Unfortunately, it suits the overall the card's discontinuity. Odd font, weird color contrast, and disjointed first and last names. Is there an upside to this card? Fortunately, yes--read on for details. 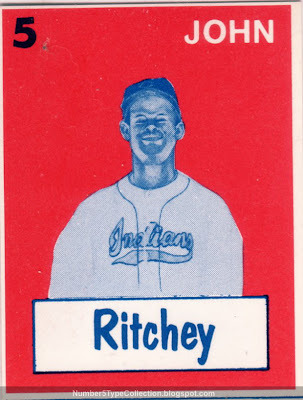 Though the portrait shows Ritchey as an Indian, he never played in the majors. There is a window where John might've worn the uni, as a member of the 1949 San Diego Padres, a one-year PCL affiliate for Cleveland. There aren't a ton of 1940s minor league photos out there, so Mr. Aldana likely used what he could find--a single spring training shot, perhaps? Value: This card cost $10 on eBay last year. They're pretty scarce, but usually come in high-grade as a direct-to-collector issue. The set contains no higher-priced "stars" to speak of. Fakes / Reprints: Despite their overall rarity, they're probably not worth reprinting. I can't figure out why someone would put out a set in the early '70s of 1940s minor leaguers. It doesn't seem like something anyone would care about back then. Agreed, not sure what led to this becoming a "real" set, given the players and crudity--it looks more like an artist practicing color print work.